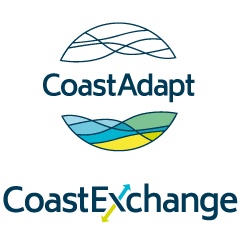 CoastAdapt contains a wealth of material to support coastal adaptation in Australia, including data, guidance materials, decision support and tools, as well as straightforward information. Navigating all this material can be confusing, so we have tried to group some common elements together. Here we gather together links to all the tools provided in CoastAdapt to support adaptation. They are arranged under three headings – data access, risk assessment and decision support. CoastAdapt also provides a searchable database of adaptation support tools developed in Australia and internationally. Shoreline Explorer provides data on present-day coastal sensitivity to flooding and erosion. Sea-level rise and You has graphs and tables showing sea-level rise amounts and allowances for all Australian coastal councils, from the present day through to 2100. Inundation mapping is provided for mid- and end century for all Australian local councils where LiDAR surveys have been carried out to provide accurate elevation data. Risk assessment templates: CoastAdapt provides four risk assessment templates that allow users to systematically follow the guidelines for assessing climate change risks, and record relevant information gathered at each step of a risk assessment. Template 1: First-pass risk screening: for a quick screen of climate change hazards and associated risks. Template 2: First-pass risk screening: useful if you want to redo the first-pass risk screening with more information and effort. Template 3: Second-pass risk assessment: to record information during a second-pass risk assessment workshop. Template 4: Third-pass risk assessment: to record information during a third-pass risk assessment workshop. Rules of thumb are easily learned and easily applied approximations or procedures to calculate or estimate some value. This content looks at rules of thumb useful for climate change and coastal recession. C-CADS (Coastal Climate Adaptation Decision Support). CoastAdapt provides the six-step decision support system C-CADS to support coastal managers seeking to address risks from climate change and sea-level rise. Checklists to evaluate your use of C-CADS (and other iterative adaptation processes), intended to support evaluation by users of their use of C-CADS.